I was three miles into a treadmill jog on Thursday when it first appeared on the TV screen in front of me. The "it" I refer to is that silver Mylar balloon moving quickly high above the Colorado landscape. It looked like a combination flying saucer (vintage 1950), mushroom cap and chef's hat, which made me giggle to myself, but, gasp, it was supposedly toting a six-year-old boy, so I tried to look as concerned as some of my fellow gym rats. When they first reported that the boy's family had been featured on the reality show Wife Swap, my suspicion rose quickly that this was all a hoax, that what we were all watching was a rather neatly staged -- and wildly successful -- publicity stunt. The boy, as we know now, was found in his attic, so when the balloon finally came down, no child -- or alien -- emerged. Later that day, when he blurted out to his father on the Larry King Show that "You guys [referring to his parents] said we did this for the show," I wasn't at all surprised. But, as a publicity man myself, I was nonetheless impressed, and it got my wheels turning: "If this kooky family from Colorado can get the whole world glued to a TV screen for a couple of hours, just think what a hot air balloon could do for the career of one of the artists our company represents!" For years my colleague Glenn Petry, my best friend and also someone I've worked with promoting music for nearly 25 years, has advocated the idea of a "Boulez Blimp," and watching that silver balloon yesterday I realized how right Glenn has been all this time. Truth be told, classical music isn't the easiest commodity to sell to the American media, and Pierre Boulez, the legendary modernist composer and conductor, was just one of our classical music heroes that we didn't have much luck getting on TV. So whenever we got to a certain point of frustration in a campaign, Glenn would roll out the blimp idea. 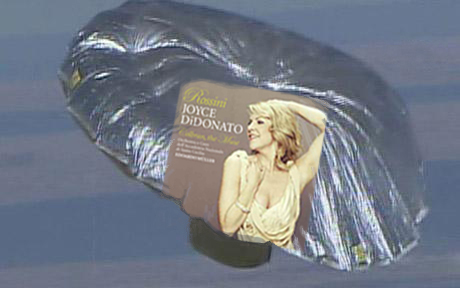 Sadly, the Boulez Blimp (or, more recently, the DiDonato Dirigible, pictured here) never got off the ground (insert guffaw here). "Oh, this is a wonderful project," one morning TV show booker (who couldn't be a more thoughtful and decent person) told me recently when I shared the video of one of my artists, the Norwegian pianist Leif Ove Andsnes, collaborating with South African visual artist Rhobin Rhode on a cool multi-media project that will debut at Lincoln Center on November 13. "But it's probably a bit too artsy for the audience who watches our show." (You can preview "Pictures Reframed" on YouTube at this link and decide for yourself). I wonder if Balloon Boy and his family will be on that same show this morning, or perhaps that story is too fake for the audience who watches it? But I digress. In my 20-plus years of promoting classical music I'm not sure I've done anything that could be described as a pure "publicity stunt." But Glenn and I have had our hands in a number of promotional ventures that have occasionally raised some eyebrows throughout our very serious and high-minded industry. Our very first promotional project back in our days working for the ultra-conservative German record label Deutsche Grammophon was to create a pack of DG Trading Cards, modeled on the ever-popular baseball cards that kids still seem to collect these days. They had stats on our artists (birthplace, instrument of choice, critical acclaim, etc.) and a bunch of "Did you know?" fun facts that I can still remember 20 years later (such as "James Levine's favorite drink is Diet Coke"). But now that I think about it, those cards totally worked. To my astonishment, I woke up one morning and saw Itzhak Perlman on the CBS morning show being asked how he felt about being on a trading card. "Oh my God," I told Glenn over the phone, "Turn on the TV -- they are playing with our DG cards!" Thousands of people wrote in, some sending cash or a check, asking for a pack of those cards, but we couldn't convince our bosses to mass-produce and sell them. But boy did we get a lot of press coverage for those cards (the press clippings after a month or so made a stack about two-feet tall). A few years later we were working with the young violinist Gil Shaham on his recording of Vivaldi's Four Seasons and Gil came up with the idea of producing a music video for it. MTV was all the rage at the time, and Glenn, himself a bass player in the alternative band Drunken Boat, had a buddy, Jem Cohen, who produced videos for the rock group R.E.M. Long story short is that Jem made a fabulous video of the "Winter" movement from Vivaldi's timeless mega-hit. Gil had the bright idea of having the video, which depicts a winter storm, broadcast on the Weather Channel, and Glenn managed, with one call to its headquarters in Atlanta, to convince the Weather Channel to do just that. A media sensation ensued, with Gil launching the album on the Today show, and articles popping up all over the place including a fabulous shot of Gil in People magazine and a seven-page spread in New York magazine. A front-page article in the New York Times "Arts and Leisure" section posed the question, "Should classical music be marketed this way, or is life as we know it coming to an end?" Thanks to YouTube, you can actually see the video, which had, for years, remained dormant on a VHS tape at the bottom of a box of record industry memorabilia, here. Looking back at this and other successes Glenn and I have had over the years (including a laser light show for Boulez's recording of Stravinsky's Firebird at New York's Supper Club -- complete with rock-'n-roll-band smoke and other amazing effects), I guess I shouldn't be jealous of the Colorado family and their silver balloon. Okay, our company's most recent video project (produced by our wonderfully creative colleague Sean Gross) -- once again with Gil Shaham, called "Run Gil Run" and viewable at this link -- hasn't quite struck the media gold that we managed with The Four Seasons, but times have changed. In the post-O.J. media age, the bar has been raised and us classical music promoters are going to have to jump a bit higher to get people's attention. 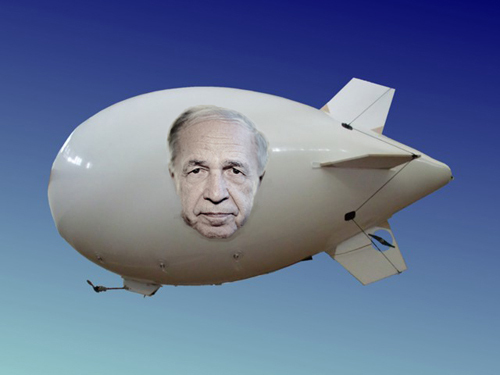 And of course, when all else fails, we can always roll out the Boulez Blimp.